Brooch is approx 2" x 1 1/2". We have recently acquired a valuable collection of jewelry from the estate of a prominent New York socialite. The collection was appraised by Hamilton Jewelers of Princeton. 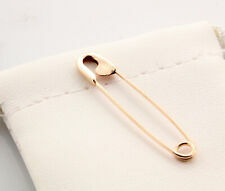 Rose gold safety pin made of solid 14K gold. 14K Solid Gold Pin's are made in USA and are of the highest quality. They are nicely polished and stamped for authenticity. Hallmarks:- The item is unmarked, but fully tests as 9ct Gold. The brooch is in very good condition for it's age. Nice petite seed pearls. Great design. Opens and closes as it should; very wearable item. Beautiful 14k rose gold, diamond and seed pearl pin/brooch. Art Nouveau sunburst is encrusted with seed pearls that have a white to dark hue. A very nice 3/16 carat center prong set old mine cut diamond is the feature in the piece. They flipped out. They couldn't believe how nice original condition this ring is in. I have had this in my collection for over 15 years. It tests between 14k and 16k. (80 years old ) I can't possibly get the cut of the stone in the pictures I tried it flashes colors almost like a alexandrite. MARKED 14K ON HOLDER AND ETCHED INTO INTERIOR OF LOCKET. PRE OWNED -- NORMAL WEAR AND TEAR SCRATCHES ON GOLD, GOLD DISCOLORATION AND DENTS. GOLD AND RIBBON 14.2 GRAMS. LOCKET: 6/8”X3/16” ROUND LOCKET WITH ONE 1.5 MM ROUND OLD MINE CUT DIAMOND. There is a pinkish-color button pearl set as his shell and two round diamonds set as his eyes. The diamond total weight is estimated at 0.02 carats. Hunter's Antiques is located in Federal Way, WA. Rose and Green Gold Leaves with Yellow Grapes. Black Hills Gold Roses long Stems Leafand Grape Cluster Brooch Pin. Marked 10K on reverse - See Pictures. There is one bent leaf tip, and possibly one missing leaf, but piece is sound overall, especially when considering its age. Still a lovely and big accessory similar to those the ladies of Walter Scott or Jane Austen's novels would have worn. Rose and Yellow Gold Bow Pin Brooch or Pendent or Clip With Light Blue Tourmaline Stone. 14k Rose and Yellow Gold 12 Grams. For more than 25 years, Yossi Dina, known as “the Pawnbroker to the Rich and Famous,” and the proprietor and president of the reputable South Beverly Wilshire Jewelry and Loan. This is a charming vintage 14k solid gold pendant in yellow and rose gold. It has 3 amethysts set in prongs. The pendant has a bow design. It is marked 14k and the initials ESEMC on the bale. I looked it up and ESEMCO is a mark found on estate jewelry. The pendant has some surface scratches and 2 dark spots on the rose gold ribbon side underneath the amethysts. You can see them in the photo. Might need a jeweler to buff them. It weighs 3.5 grams and measures approximately 1 and 1/2 “ long. Pictures are enlarged to show detail. This is a preowned pin and it will show signs of use. Other stones might show a little scratch or so. It is 10 grams in weight. It is made of solid 18 kt gold (tested). GAL APPRAISAL CARD INCLUDED. All the Appraisers are experienced GIA Graduates. FOR SALE IS THIS 10K(ACID TESTED) ROSE GOLD BREVETE WATCH. WATCH IS NOT RUNNING AND WEIGHS 18.17 GRAMS. SOLD AS IS. It weighs 4.1 grams. It is marked Tiffany & Co. AU750 Italy. It is in very good condition with only minor scratches consistent with light wear and age, and would make a wonderful addition to your collection! You are viewing a 14k gold pin with seed pearls and a blue stone. The gold appears more rose than yellow but not full deep rose. I believe the blue stone to be hand cut glass or alike. I dont have any other information on this piece. Made from Solid 14k Rose Gold and weighs 3.5 grams. Stamped PATENT on the back. FOR SALE IS THIS 10K ROSE GOLD WARTRA FRENCH LADIES PIN WATCH. IT IS 17 JEWEL UNADJUSTED, 29MM WIDE X1 5/8", LENGTH IS 2 5/8" WITH PIN(NOT SOLID GOLDJUST UNDER 1" X 1 1/8"). DIAL DOES HAVE A HAIRLINE CRACK FROM 9 TO UNDER 5, CHRYSTAL HAS LIGHT WEAR, WITH CHIP ON EDGE JUST LEFT OF 12. Antique Deco 9K Rose Gold Abalone Mother of Pearl Oval Brooch Pin 1.25" by 1"
Weight is 3.5grams. The abalone plays with the light; looks great on fabric. This is for a black hills gold tie tack or pin in the shape of an angel. The wings are the traditional black hills gold rose and Green leaf shapes the body of the angel is a beautiful purple stone and the head of the angels is a diamond. The angel measures about 1 cm from head to toe and the tie tack is also 1 cm in diameter. When the tack is attached to the angel it is about a half an inch deep. This is the original black hills gold box however the insert was torn so we improvised on a cotton Like substance. This was never worn but simply stored in a safe place from our family estate. Please take a close look at our pictures for this item and we will be happy to answer any questions thank you. 9ct Rose Gold – Full Hallmark. Fancy Pattern Brooch. Traditional Pin Fastening. GTC – PO Box 10229. All jewellery & watches are Pre-Owned unless stated otherwise and condition should be considered as such. Up for sale is a lovely antique brooch, attributed to Victorian period. Finely handcrafted in solid 14K rose gold. Tested - 14K gold. 14k yellow gold hollow rose and stem pin. The rose is 1/2" wide. It weighs 1.9 grams and is marked 14k JTC on the pin back. Rhodalite Garnet. -----If we refer to a stone as a diamond, then it is a natural earth mined diamond. Gram weight. Approximate carat total weight of main stone. Approximate carat total weight of all colored and non diamond stones. You are viewing an Antique Moon & Stars Stick Pin made of 18k Rose Gold with two Rose Cut Diamonds & one Ruby. This is quite a lovely piece, sort of a crescent moon with center having a Ruby set in a cut out star and on each side of that there is a Rose Cut Diamond, also set into a star. LOVELY 14K ROSE GOLD "DOLPHIN" BROOCH 4 GRAMS. 14K ROSE GOLD "DOLPHIN" BROOCH 4 GRAMS, APPROX. 33 X 31 MM. We only use photos of the. Free Ring Resizing. If stones are present, they will have been tested by aPresidium Gem Tester and Presidium Multi Tester. Condition: Pre-owned: Very Good! the pin is straight and closes securely. Coins, Bars, Notes & Bullion. DEC Zircon & Tanzanite. OCT Opal & Tourmaline. Genuine Turquoise with Matrix -. MAR Aquamarine. Belt Buckles. JAN Garnet. NOV Topaz & Citrine. Tested 10k. We test all gemstones with a Presidium Gem Tester. Many gemstones' properties overlap and could potentially be one of many variety of gemstones. Add Us To Your Favorites. Our Testing Process. The diamond is secure in the mountings has a wiggle at the connection to the pin. I think it is part of the design and it seems like it is secure. See photos to help further judge the condition. Very good condition. Light surface scratching to the gold. Marked 585 HUX. Wonderful mix of both yellow and rose gold to form the roses. Weighs 8.4 grams. The back pin is bent to conform to the shape of the brooch and functions correctly. This brooch is 14k Rose solid gold. Brooch weights 7.1 grams. On the corner is a flower made of blue sapphires and rose gold leaves. Hallmarked R 14K. 14K ROSE GOLD PEARL BROOCH. The color of the pin goes beautifully with the 19 white pearls. 19 round white pearls. size 4.9-5.5mm pearls. 14 karat rose gold. Condition is very good. Weight: 10.5 grams. Up for sale is this ESTATE 10k Rose Gold Filigree Belt Buckle Pin/Brooch. Material Information: Solid 10k (417) Rose Gold. Markings on Clasp: (Designer's Insignia). I take very high quality photos at very close proximity on pure white backgrounds to show this ring and others exactly as they are. 14k rose and green gold. Our jeweler has inspected/refurbished this item: it is in excellent condition. Rose/Green Gold Diamond Scroll/Leaf Pin/Brooch.